Rachel lives in Nebraska, USA and wanted to share her beloved Shadow’s story with the world. 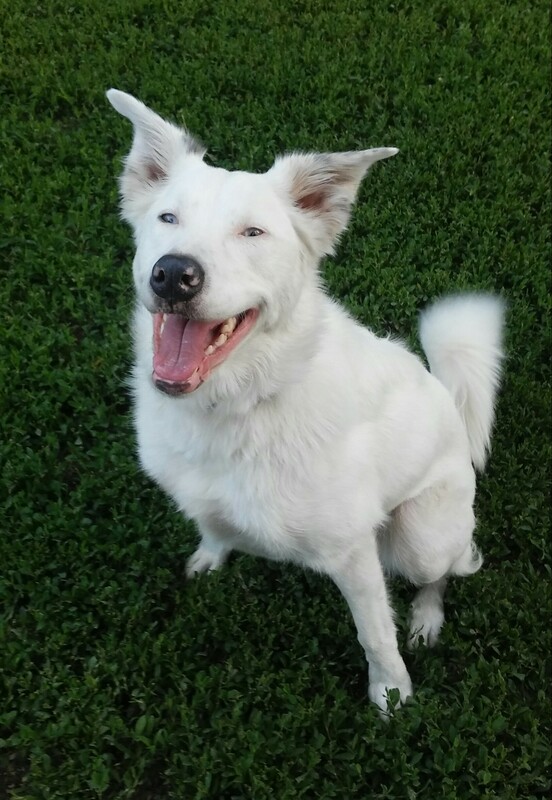 Shadow is a deaf, pure white border collie who has never let her disability prevent her from achieving some great things! 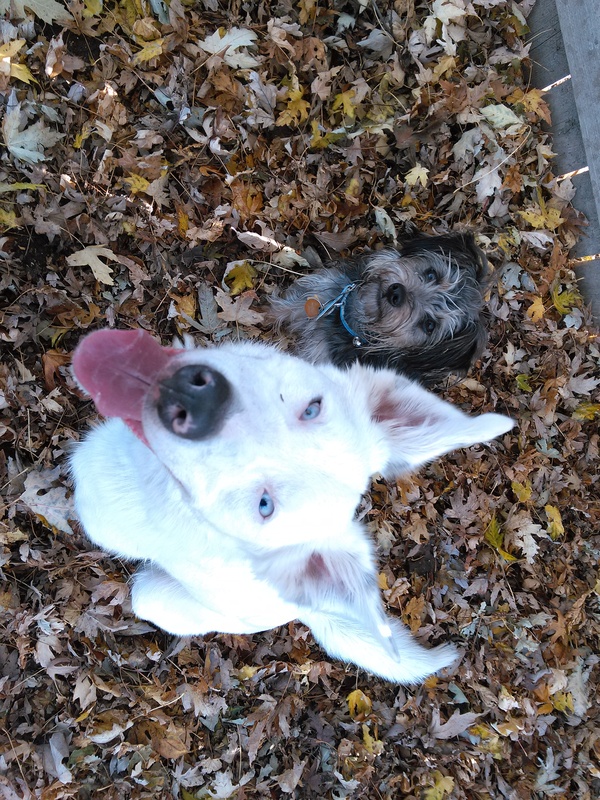 In this great Q&A, you can learn more about how Rachel has managed to help train Shadow to pass The American Kennel Club’s Canine Good Citizen test (CGC). What is the name of your border collie and tell us about her (age, place of residence, any interesting background history, unique habits, etc…)? Shadow is 3 years old and lives in a small town in central Nebraska. Shadow was part of a puppy mill that was breeding intentionally to get pure white dogs. She started learning adapted American Sign Language at the age of 9 weeks and now knows 42 commands. She learns very quickly, she was fully potty trained by the age of 10 weeks. She loves to play Frisbee, fetch and chase bubbles. How did Shadow become part of your family? 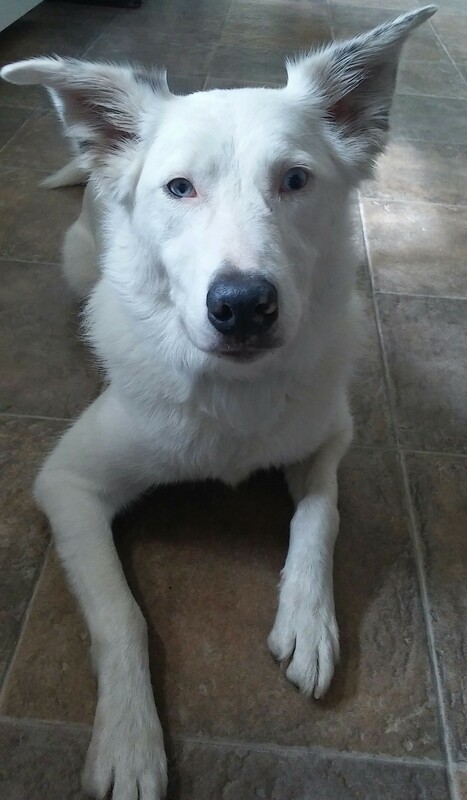 We found Shadow on Craigslist listed as “White Shepherd Puppy”. When I called to inquire, the lady told me the puppy had been rejected by her mom at 4 weeks old and she was eating on her own. She also informed me that the puppy was turning 6 weeks and it had to go because she could no longer care for her. With the OK of our vet we went and picked her up at a gas station not knowing exactly what breed she was. Tell us about Shadow‘s condition? How did you find out? We discovered that Shadow was deaf when she was 9 weeks old, The smoke detector went off and it didn’t startle her or even wake her up from her nap. So I contacted the previous owner and she finally admitted to me that the mom and dad were both Merles. 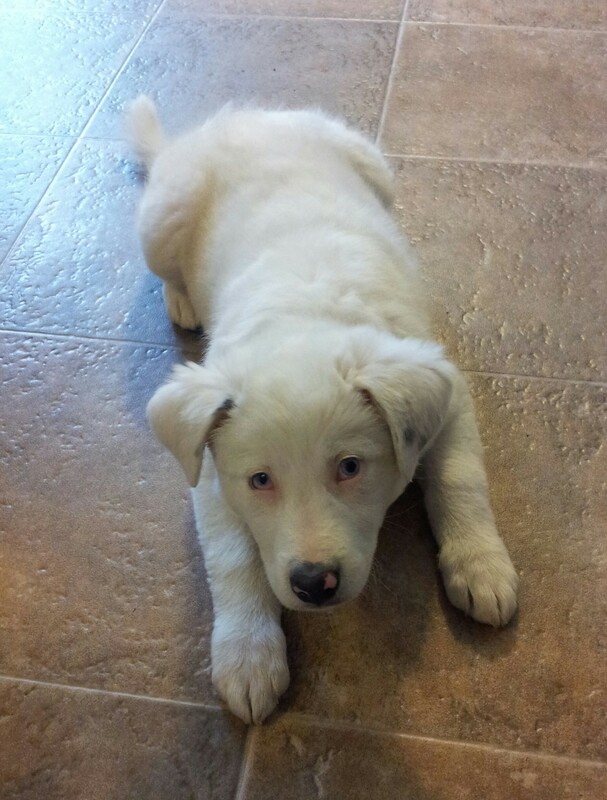 With a lot of online research and calling breeders, I was told that she is deaf due to the breeding of 2 Merle* dogs. *What is a Merle? Merle is a gene that gives the dog a marble pattern on the dogs coat. When breeding 2 Merle dogs there is a 25% chance of each pup being blind, deaf or both. If a puppy is born with 2 copies of the Merle gene, it can strips the coat of color/pigmentation which can causes the eyes and ears to not fully develop. Has being deaf been an issue for you and Shadow? How has it affected your relationship? Shadow‘s deafness has never been a issue. Although we have had our fair share of obstacles along the way, it’s nothing that a little patience and practice can’t fix. Shadow‘s deafness has had no bearing on how strong our bond is, It is the quality time spent with her that has made that bond strong. You mentioned that you’ve been working with Shadow on attaining her trick dog titles, can you tell us more about that? Why did you decide to go for those titles? We were looking for something fun and challenging to do with Shadow, so I bought some books called 101 Dog Tricks and 10-Minute Dog Training Games . These books encourages the trick training to help you to engage, challenge and bond with your dog. The author of the books has a website called Do more with your dog and they offer trick dog titles at different levels of difficulty. Shadow caught on quickly and had fun with the trick training, so I decided to do the titles in memento of our hard work and accomplishments. You mentioned that Shadow recently earned her AKC CGC? What is that? How did you work through Shadow‘s disability to ensure she followed command and learned her tricks? The American Kennel Club’s Canine Good Citizen test (CGC) is a certification program that evaluates dogs in simulated everyday situations. Dogs that pass the CGC test are considered reliable family and community members and will receive a certificate and title (if registered with AKC) from the American Kennel Club. To ensure that Shadow followed the commands we started practicing for the CGC almost a year prior to the test and took a CGC class so we knew what was expected during evaluation. What is next for Shadow? What does the future hold for you and her? The AKC just changed their rules to allow deaf dogs to compete in Agility, Rally Obedience, Tracking and Sent Work. We may try out some of these sports in the future. Do you have any advice for other Border Collie Fan Club members who have dogs with a hearing issue on how best to care for and train them? Patience and positive reinforcement is a must! The obedience training is the same as any other dog but it’s crucial that the dog focuses on you to learn the hand signals. “Watch me” is one the most important commands that your dog will learn. It will create a sturdy foundation to build your obedience training on because your dog will be always paying attention to you for the next command. Make sure your hand signals are distinct and keep your training sessions short but sweet to avoid frustrations.